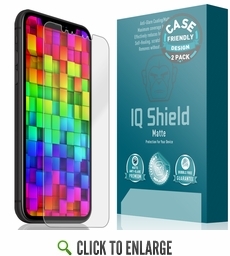 This new line of IQ Shield protectors is designed to provide a special anti-glare coating that reduces glare and allows users to use their devices in brightly lit conditions. IQ Shield Matte finish protectors provide the same unmatched protection against scratches, dents and other abrasions, offered by the original IQ Shield LiQuidSkin line. The ultra-thin, yet extremely durable, film keeps your device fully protected while also keeping it fully responsive. • Unique outer layer coating greatly reduces glare and fingerprints allowing users to use their devices on brightly lit conditions. • Unlike traditional PET protectors, the extremely durable military-grade film used in IQ Shield Matte finish protectors is designed to adhere to curved and round areas of your device. • Unparalleled protection against scratches, dents and abrasions. • Unique “wet application” easy install method allows for a frustration and bubble free application to your device. • One-of-a-kind manufacturing process ensures protectors have accurate cutouts and precise fitment to your device. We back IQ Shield products with a Lifetime Replacement Warranty. We're so confident in our products; you'll receive 100% completely free replacements should you need to replace your IQ Shield Matte protector for any reason!